I see a blank Scanner Settings window when I start Epson Scan 2. What should I do? Follow the steps below for your connection type. Turn on your product, if necessary. Make sure your product is connected to your computer or USB hub. Start Epson Scan 2. If you see your product in the Scanner Settings window, the problem is solved. If you see a blank Scanner Settings window, close the window and go to the next step. Note: If your product is connected to a USB hub, make sure the hub has its own power source. If your product is connected to a USB hub, connect the USB cable directly to your computer instead. Start Epson Scan 2. If you see your product in the Scanner Settings window, the problem is solved. If you see a blank Scanner Settings window, close the window and go to the next step. If your product is not connected to a USB hub, go to the next step. Use a different USB cable. Start Epson Scan 2. If you see your product in the Scanner Settings window, the problem is solved. 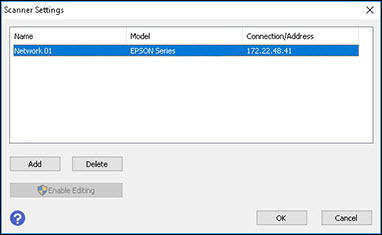 If you still see a blank Scanner Settings window, contact Epson Support. 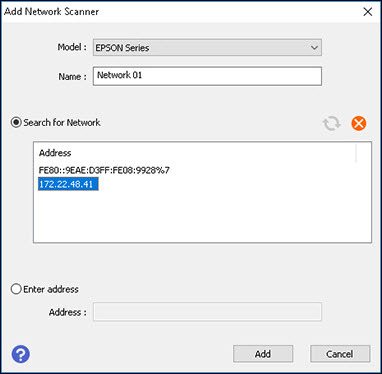 Make sure your product is connected to the same network as your computer and start the Epson Scan 2 Utility. The Scanner Settings window appears again. Note: If you don't know your product's IP address, you can print a network status sheet to obtain it.